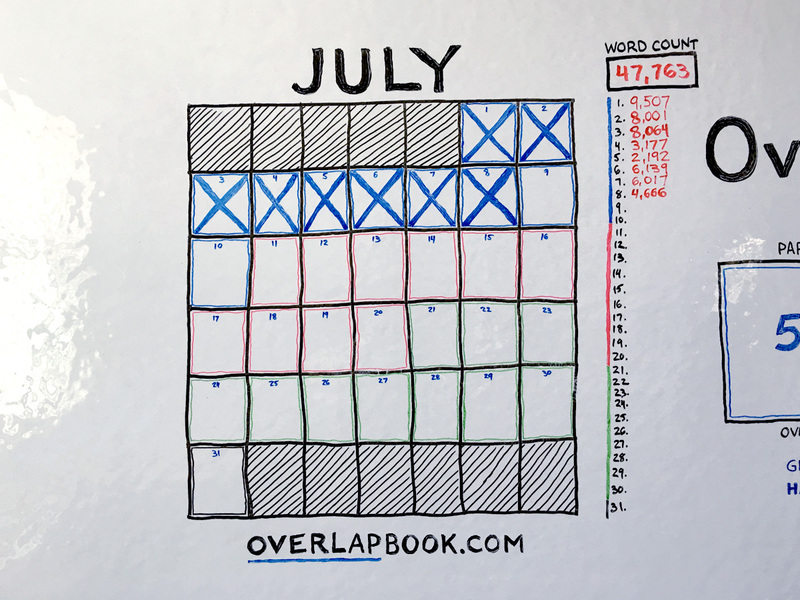 It’s hard to believe it’s already Day 8 of writing a book in a month. I’m back to running today! 4:30am wake time and a run feels so good. Not the waking up early and the running parts of course, but having done both makes me feel really good about the day. It feels like I own the day. Cory came over at 4:30am to shoot some footage for a special project. More on that to come. It was a solid day. Admittedly, I got caught up in reading the news for the first hour. That was my fault for even checking Twitter and hearing about current events. I shouldn’t have been looking at social media before I started writing. I allowed myself to be distracted on four occasions today and that probably hurt my word count. Still, I’m pretty happy about 4,666 words today. I’m just logging that note to remind myself of how much more productive I could have been. The main distractions were having to talk to a few customer support representatives for various utility and services billing issues, order some office equipment, and deal with a report that our transactional email functionality was broken and our emails were not being delivered properly. Most of the distractions were legitimate, but I still could have been better about protecting my focus. All of these issues could have been handled after I finished my writing for the day. Today, I wrote about making money with products. If you want to make money the easiest way, look house-on-fire problems. If your house is on fire, are you just going to sit around and finish watching the latest episode of your favorite show? Of course not! You’re going to fix the problem. You have to. The closer you get to house-on-fire problems, the easier it will be to make money. When you’re further away from a house-on-fire problem, people can take it or leave it. You’re fighting an uphill battle to make money and generate cashflow for your business. What problems will people actually pay to make go away? What problems are they currently paying to solve? Open your eyes and look at the world with the intent to find and identify problems. Most people don’t look for problems. They don’t go out of their way to concern themselves with the problems of others, they only care about themselves and their own problems. These people are not entrepreneurs. Watch people and observe what they pay for. Listen to people and hear what they complain about. Find real problems by observing, don’t guess at them. Keep a notepad with you at all times and study. Write down what you observe. Take notes of the problems you see and hear everywhere you go. There are so many opportunities—the reason you don’t see them is because you’re not opening your eyes to them. They are all around. When you walk outside your house with your eyes open you’ll see lawns that aren’t mowed, windows that aren’t washed, dogs that aren’t walked, leaves in the yards, and weeds in flower beds. If you learn to look for problems other than your own, you’ll see many opportunities to make money. We all pay for time. People don’t want to wait for shipping. They don’t want to wait for a car. They don’t want to wait for coffee. They don’t want to wait for food. People will pay to get their time back. People will pay to make money. If you want to make money the easiest way, find ways you can save people time or save them money. If you’re selling nice-to-have products to people who DON’T have money, don’t expect to make a lot of money. You have to respect the market. Maybe your passion involves something that doesn’t solve problems or you’ve created a nice-to-have product. Well, you can’t just demand that the market pay you. The market decides what is valuable. If you have money, you can do whatever you want. There are no rules. You’re not limited to only selling money-making products. But if you don’t have money, you have to be strategic. If you start with a money-making product and sell it to people who have money, it grants you the freedom to create whatever else you want for whoever else you want to market to regardless of whether or not you turn a profit. When you start by selling products that make money to people who have money, you’ll make money that enables you to do anything. Start with the person: Who are you serving? Does your product make money for this person, directly or indirectly? Is your product solving a house-on-fire problem? Can this person afford to buy your solution? [Easiest] Sell products that make money to people who HAVE money. [Easy] Sell products that are nice-to-haves to people who HAVE money. [Hard] Sell products that make money to people who DON’T HAVE money. [Hardest] Sell products that are nice-to-haves to people who DON’T HAVE money. You want to launch something. You want people to care about it. You want them to buy. You don’t want to launch to crickets. Maybe you made an app. Maybe want to launch a new product, subscription, or service. Maybe you have a really cool course. It’s going to help a lot of people. Most people have two diametrically opposed goals: they want to keep their idea a secret while they make it, but when they launch they want everyone to know about it and care. The problem is it doesn’t work like this.